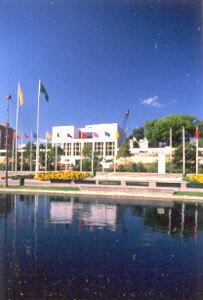 View of the Knoxville Museum of Art from the Knoxville World s Fair Park. Opened in 1961 as the Dulin Gallery of Art, the Knoxville Museum of Art was originally housed in an early twentieth-century neighborhood mansion designed by noted American architect John Russell Pope. As the museum grew, however, the limitations of the private home became evident. Inferior security and inadequate climate control prevented the Dulin from being accredited by the American Association of Museums and therefore limited the museum’s ability to attract important exhibitions. Intending to establish a regional fine arts museum, the board of trustees decided in 1984 to build a state-of-the-art facility in the heart of Knoxville on the 1982 World’s Fair site. Plans for the new museum were met with great support from the community as $9.5 million was raised for the building fund. In 1987 the Dulin Gallery of Art underwent a formal name change and became the Knoxville Museum of Art. The museum moved from the Dulin mansion to an interim location in the “Candy Factory” building on the World’s Fair site adjacent to the construction site of the new museum. On March 25, 1990, more than five thousand people attended the greatly anticipated grand opening of the new Knoxville Museum of Art building. Celebrated New York architect Edward Larabee Barnes designed the modern 53,200-square-foot building that currently houses the museum. The steel and concrete building, faced in Tennessee pink marble, is often referred to as the “crown jewel” of the World’s Fair Park. The Knoxville Museum of Art contains 12,700 square feet of exhibition space in five galleries as well as a Sculpture Terrace, an Exploratory Gallery, a computer-interactive ARTcade, and two large outdoor garden areas. Other features include the Great Hall with a panoramic view of the city, a 170-seat auditorium, and the museum gift shop. The museum received its AMA accreditation in 1996. The KMA Collection: Art During and After the Twentieth Century is the institution’s first permanent exhibit. In addition to its growing collection of American contemporary art, the museum has hosted more than 120 traveling exhibitions since 1990. Notable recent exhibitions include The Passion of Rodin: Sculpture from the Iris and B. Gerald Cantor Collection and American Grandeur: Masterpieces from the Masco and Manoogian Collection. These exhibits, combined with strong interactive educational programs with area schools and popular public programs such as the “Alive After Five” jazz series, as well as numerous films, lectures, workshops, and symposiums, have contributed to the increasing success and growing stature of the museum. The Knoxville Museum of Art provides a wide variety of exhibitions, intensive educational outreach, exciting public programs, and art acquisitions that enable the museum to effectively serve the cultural needs and interests of diverse communities throughout East Tennessee.